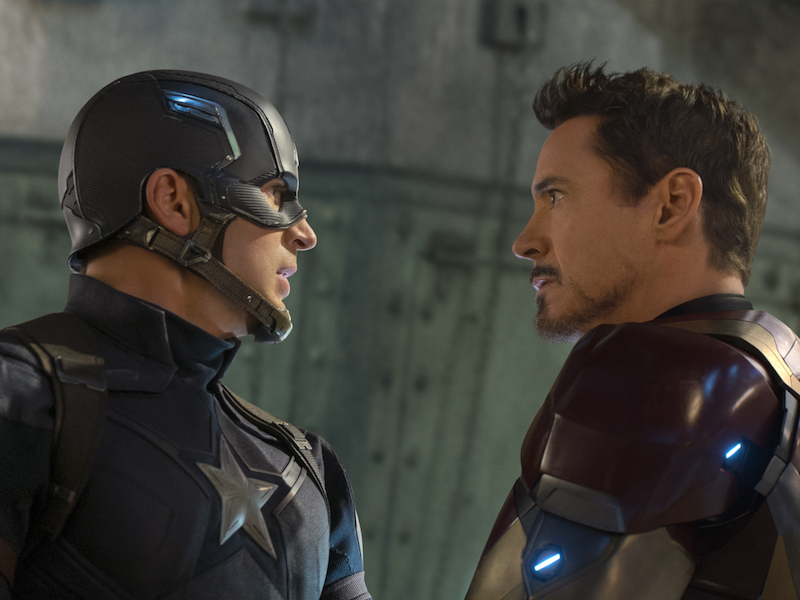 Captain America: Civil War, the latest offering from the ever-expanding Marvel Cinematic Universe, is technically the third film in the Captain America series but given its inclusion of so many of the studio’s other superhero characters, it plays more like a semi-sequel to Avengers: Age of Ultron (The Avengers 2.5, let’s say). As such, it’s the most narratively dense and potentially overwhelming Marvel movie to date but it’s also the most morally ambiguous and dramatically ambitious entry thus far. The important part is that despite the heaviness of the story and its themes, there are also counterpoints of levity and dazzling action setpieces that strike up a sound balance of enlightenment and entertainment. The story picks up after the disastrous events in Sokovia from Ultron and following a more recent incident in Lagos that left unexpected civilian causalities, the actions of the Avengers are being scrutinized more thoroughly than ever before. The United Nations puts forth an act that calls for more oversight and regulation for those with “advanced abilities”, which Iron Man (Robert Downey Jr.) views as a sensible guideline of personal responsibility but Captain America (Chris Evans) sees as an oppressive measure of over-regulation. This ideological rift, among other factors, leads to a showdown between Team Captain and Team Iron Man (involving too many superheros to name here) that threatens to permanently tear the Avengers team apart. Those uninitiated with the MCU and the events of the preceding films will likely be completely lost within the first 10 minutes of Civil War and even if you are a more-than-casual fan like myself, you may still find yourself misplacing certain characters or trying to recall previous plot points during its lengthy runtime. What’s important here is that directors Anthony and Joe Russo tell their story with respect to the intelligence of their audience regardless of how familiar they are with each facet of the Marvel world. Of course rigorous superfans will likely get the most out of the experience but even first-time viewers should find plenty to enjoy among the well-choreographed fight sequences and the reliable acting talents of the impressive ensemble cast. One of the most refreshing elements of this film is the emphasis of accountability that has been breached in several other superhero movies before but not to the degree to which it’s examined here. On the basis of entertainment, we continually watch these characters lay waste to one major city after another but Civil War tactfully explores the residual effects that these catastrophes have on the ordinary people who occupy those affected areas. When the mother of a son who died in the Sokovia incident confronts Tony Stark after he gives an impassioned speech, it reaches a level of poignancy and groundedness that is uncommon among other films of this genre. Without delving much more into the elaborate storyline, I should mention just how happy I was with the ultimate villain of this film. Between Age of Ultron‘s Ultron to Ant-Man‘s Yellowjacket (not to mention whoever the villain of Guardians of the Galaxy was), Marvel has been seriously lacking in the compelling bad guy department but Civil War brings about the most satisfying antagonist since Loki in The Avengers. In the words of Roger Ebert, “each film is only as good as its villain” and I’m happy to report that both are first-rate.